The Deep Learning Summit returned today to London, accompanied by the Deep Learning in Healthcare Summit. The dual-track event once again brought together some of the leading experts in their fields to present and discuss the latest technological advancements and breakthroughs in a range of industries including healthcare, social networking platforms, finance, academia and more. The high standard of content and presentations was mirrored on the Healthcare track, which kicked off with discussion surrounding AI in the NHS and Clinically Applicable Deep Learning Techniques from Sarah Culkin of the NHS and Trevor Back from DeepMind Health respectively. Trevor’s current research includes that of cancer detection and predictive patient deterioration, with Trevor stressing the need to collaborate with the NHS and fellow health providers to make a substantial impact on the healthcare industry. What else did we learn in this morning’s sessions? Alongside the presentations, interviews and networking sessions were interactive workshops, focussing on Ethics within AI, Predictive and Generative Deep Learning for graphs and a roundtable discussion including Machine Learning researchers, strategic data leads and postdoctoral research associates. The Mapping workshop, run by Cansu Canca and Laura Haaber Ihle looked at how we can structure ethical problems at hand, delving into the underlying principles before attempting to solve the issues at hand. The engaging workshop involved attendee collaboration and assessment of practical implementation methods, gradually working toward the creation of practical solutions. Other workshops throughout the day posed questions including the potential need for alteration of search engine results to reduce bias, and whether search engine results should be based on the prominence of an individual, or the number of results available, with the example of famous sports stars maintaining prominence in search engine results over namesakes of equal importance. Tomorrow, we’re looking forward to learning from Accenture in their workshop session, ‘How to Design AI with Human Centricity’. After breaking for lunch and more networking opportunities, the afternoon presentations continued with talks including multimodal and multilingual context models from Lucia Specia, Professor of NLP at Sheffield University, which preceded a discussion surrounding Custom Vision Services and their standing against manually developed machine learning models from Tom Szumowski at Urban Outfitters. Tom’s presentation included in-depth technical discussion and numeric representations of data, however, it was stressed that without domain knowledge and a real understanding of your product, the high-level models available will be significantly restricted. Tom’s talk also set a milestone for RE•WORK as the first presentation to be live streamed on the RE•WORK YouTube channel. If you missed the stream, fear not, as Tom’s presentation, alongside all other talks, will be uploaded to the RE•WORK Digital Content Hub post-event. Further highlights from the afternoon presentations included Content Discovery with Semantic flow from Jian Li at Sky, Managing Alcohol Misuse by Automation from Daniel Leightley at King Centre for Military Health Research and Event Prediction with Deep Learning from Janahan Ramana of Borealis AI. A number of podcasts and interviews were completed throughout day one of the events, further discussing presentation topics, current research and what to expect next! Day one was brought to a close with networking drinks for attendees, followed by the official attendee dinner and further discussion surrounding the presentations seen on day one! We will be back tomorrow with another day of technical discussion and presentations, including talks from Pipeline AI, MedicScan, Google Brain, Imperial College London and more. 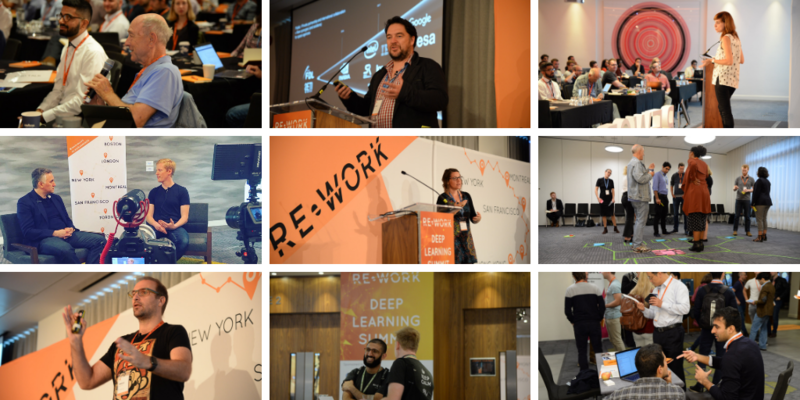 For day two updates, make sure you’re following our official event Twitter accounts and hashtags on @reworkDL, @reworkHEALTH, and give our Twitter Ambassadors a follow @TuuliaTimonen, @DeepTech2_0, @verdictUK, @Yssybyl, @TechHub. Couldn't make it to London? Check out our calendar of upcoming events and join us in Toronto, Houston, San Francisco and many more destinations as we continue our global events.